With reports of strange clown attacks on the rise across the United States, there’s a good reason we’re feeling extra creeped out. These fiendish clowns have reportedly tried to lure women and children into the woods, chased people with knives and machetes, and yelled at people from cars. They’ve been spotted hanging out in cemeteries and they have been caught in the headlights of cars as they appear alongside desolate country roads in the dead of night. This isn’t the first time there has been a wave of clown sightings in the United States. After eerily similar events occurred in the Boston area in the 1980s, Loren Coleman, a cryptozoologist who studies the folklore behind mythical beasts such as Bigfoot and the Loch Ness Monster, came up with something called “The Phantom Clown Theory;” this theory attributes the proliferation of clown sightings to mass hysteria (usually sparked by incidents witnessed only by children). It’s impossible to determine which of these incidents are hoaxes and which are bona fide tales of clowning around taken to the extreme. Nonetheless, the perpetrators seem to be capitalizing on our longstanding love-hate relationship with clowns, tapping into the primal dread that so many children (and more than a few adults) experience in their presence. In fact, a 2008 study conducted in England revealed that very few children actually like clowns. It also concluded that the common practice of decorating children’s wards in hospitals with pictures of clowns may create the exact opposite of a nurturing environment. It’s no wonder so many people hate Ronald McDonald. But as a psychologist, I’m not just interested in pointing out that clowns give us the creeps; I’m also interested in why we find them so disturbing. Earlier this year I published a study entitled “On the Nature of Creepiness” with one of my students, Sara Koehnke, in the journal New Ideas in Psychology. While the study was not specifically looking at the creepiness of clowns, much of what we discovered can help explain this intriguing phenomenon. Clown-like characters have been around for thousands of years. Historically, jesters and clowns have been a vehicle for satire and for poking fun at powerful people. They provided a safety valve for letting off steam and they were granted unique freedom of expression—as long as their value as entertainers outweighed the discomfort they caused the higher-ups. Jesters and others persons of ridicule go back at least to ancient Egypt, and the English word “clown” first appeared sometime in the 1500s, when Shakespeare used the term to describe foolish characters in several of his plays. The now familiar circus clown—with its painted face, wig, and oversized clothing—arose in the 19th century and has changed only slightly over the past 150 years. Nor is the trope of the evil clown anything new. Earlier this year, writer Benjamin Radford published Bad Clowns in which he traces the historical evolution of clowns into unpredictable, menacing creatures. The persona of the creepy clown really came into its own after serial killer John Wayne Gacy was captured. In the 1970s, Gacy appeared at children’s birthday parties as “Pogo the Clown” and also regularly painted pictures of clowns. 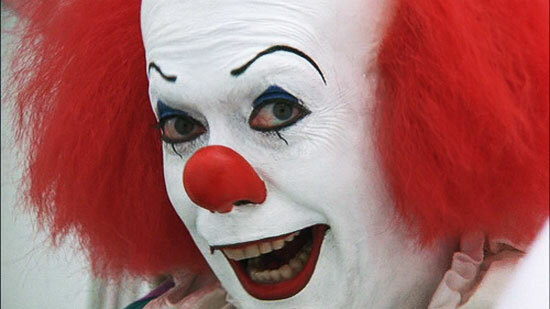 When the authorities discovered that he had killed at least 33 people, burying most of them in the crawl space of his suburban Chicago home, the connection between clowns and dangerous psychopathic behavior became forever fixed in the collective unconscious of Americans. Following the notoriety of Gacy, Hollywood exploited our deep ambivalence about clowns via a terror-by-clown campaign that shows no signs of going out of fashion. Pennywise, the clown from Stephen King’s 1990 movie It, may be the scariest movie clown. But there are also the Killer Klowns from Outer Space (1988), the scary clown doll under the bed in Poltergeist (1982), the zombie clown in Zombieland (2009) and, most recently, the murderous clown in All Hallow’s Eve (2013). Psychology, however, can help explain why, clowns—the supposed purveyors of jokes and pranks—often end up sending chills down our spines. My research was the first empirical study of creepiness, and I had a hunch that feeling creeped out might have something to do with ambiguity—about not really being sure how to react to a person or situation. We recruited 1,341 volunteers ranging in age from 18 to 77 to fill out an online survey. In the first section of the survey, our participants rated the likelihood that a hypothetical “creepy person” would exhibit 44 different behaviors, such as unusual patterns of eye contact or physical characteristics like visible tattoos. In the second section of the survey, participants rated the creepiness of 21 different occupations, and in the third section they simply listed two hobbies that they thought were creepy. In the final section, participants noted how much they agreed with 15 statements about the nature of creepy people. The results indicated that people we perceive as creepy are much more likely to be males than females (as are most clowns), that unpredictability is an important component of creepiness, and that unusual patterns of eye contact and other nonverbal behaviors set off our creepiness detectors big time. Unusual or strange physical characteristics such as bulging eyes, a peculiar smile, or inordinately long fingers did not, in and of themselves, cause us to perceive someone as creepy. But the presence of weird physical traits can amplify any other creepy tendencies that the person might be exhibiting, such as persistently steering conversations toward peculiar sexual topics or failing to understand the policy about bringing reptiles into the office. When we asked people to rate the creepiness of different occupations, the one that rose to the top of the creep list was—you guessed it—clowns. The results were consistent with my theory that getting “creeped out” is a response to the ambiguity of threat and that it is only when we are confronted with uncertainty about threat that we get the chills. This reaction could be adaptive, something humans have evolved to feel, with being “creeped out” a way to maintain vigilance during a situation that could be dangerous. In light of our study’s results, it is not at all surprising that we find them to be creepy. This is perfectly consistent with my hypothesis that it is the inherent ambiguity surrounding clowns that make them creepy. They seem to be happy, but are they really? And they’re mischievous, which puts people constantly on guard. People interacting with a clown during one of his routines never know if they are about to get a pie in the face or be the victim of some other humiliating prank. The highly unusual physical characteristics of the clown (the wig, the big red nose, the makeup, the odd clothing) only magnify the uncertainty of what the clown might do next. Frank T. McAndrew is a Professor of Psychology at Knox College.